Goals from Matthew Dudley and Ali Waddecar gave Brig the NPL Premier League points in a 2-0 victory over Witton Albion at the Sir Tom Finney Stadium. Dudley opened the scoring in the 11th minute, Waddecar adding the second eight minutes later. But Lancaster City’s misery continued with a 3-1 defeat at Gainsborough Trinity. Matty Blinkhorn got the Dolly Blues’ consolation goal. Clitheroe a 2-1 win at Leek Town. But Kendal Town went down 1-0 at home to Newcastle Town. In the National League, AFC Fylde’s flying start continued with a 3-1 win at Ebbsfleet United, Danny Rowe (2) and Gime Toure on target. 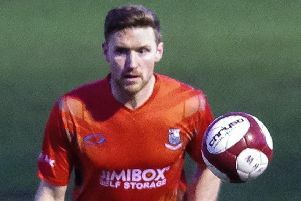 After holding on to a 1-0 lead for 77 minutes, Southport fell to a sucker punch from Spennymoor Town in their National Lreague North encounter as the game ended 1-1. In front of a crowd of 821, Ryan Astles’ header from Eliott Osborne’s corner in the 17th minute opened the scoring and Jason Gilchrist nearly made it two with a header three minutes later. The visitors came back strongly and Dan Manford in the Southport goal made a whole series of fine saves. But after hitting the crossbar, Spennymoor got their reward when a header from Glen Taylor earned them the draw in stoppage time. In FA Vase first qualifying round action, Charnock Richard won 2-1 at Alnwick Town. Burscough knocked out Alsager Town 5-1. But debutants Longridge Town went down 3-1 at home to Vauxhall Motors, despite Richard Allen giving them a first-minute lead.